Taking the train from Hamamatsucho/ Daimon on the Toei subway Asakusa line, to Asakusa. I then wish to take the Tobu train from Asakusa to Kinugawaonsen. My question is, is the arrival station the same as the one I depart? Or do I have to exit and go to another building? If so, are the 2 stations close by ? Are there escalators or lifts within the station/s? Without meaning to sound rude the Station Layout part of Wikipedia page explains it well. It's the same building but you have to walk at ground level between the two companies stations https://en.wikipedia.org/wiki/Asakusa_Station_(Tokyo_Metro,_Toei,_Tobu) there are lifts from the platform to ground level. If I had found it after a lengthy search, I wouldn’t have asked the question! As a matter of fact, the information on Wikipedia is incorrect. I rang Tobu and I’ve got the correct answer, which I should have done in the first instance. Tobu Asakusa station building location is different, about 5 mins far north. Toei Asakusa line Asakusa station is underground, platform is B4, No.2, A2-b is elevator. Ticket office is 1F, ticket gate and platfom are 2F. 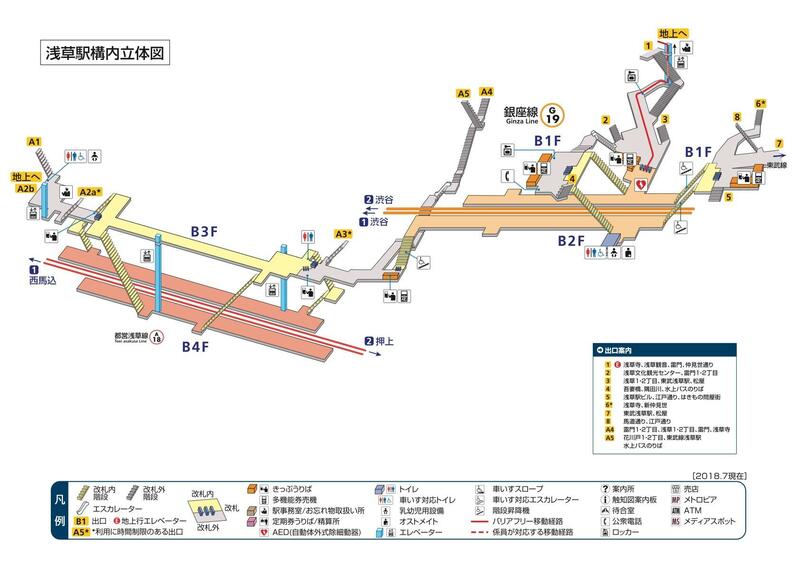 Four Asakusa Stations are in different station buildings, I should say. are standing in a row, in this order from southwest to northeast. is apart from these three Asakusa Stations. (= the ground floor) of Tobu Asakusa Station. basically does not give you admission to its station. currently there is no special rule to let you get through the area inside the Tokyo Metro ticket gates. : Toei Subway Asakusa Station is on the left. are not equipped with elevators or escalators. then you take the elevator up to Exit A2-b on the ground. then you pass through the nearby ticket gate. and purchase there the Limited Express ticket. (#) Tobu Express (without "Limited"), Section Express and Limited Express are distinguished. are the 2 stations close by ? from Toei Subway Exit A2-b to Tobu Main Entrance. which is near a crossroads. and take the nearby crosswalk [zebra crossing]. and get to the next crossroads. turn to the left, and take another crosswalk. (5) You see on your right Tobu Asakusa Station Main Entrance. The three links are not put correctly in my previous response, presumably due to extra spaces in the URLs. I’m extremely grateful for the detailed information, in particular access from one building to another as I’ll have a small roller bag (and coming straight off an overnight international flight). 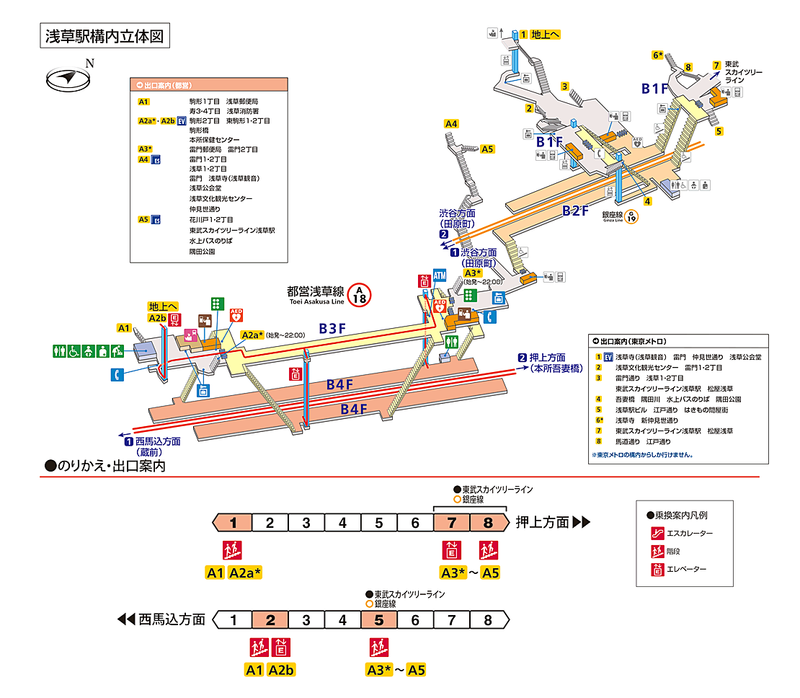 Generally, station maps in Japan are easy to locate online, even those in non urban areas. But for some obscure reason Asakusa Station details eluded me. To add to the mix, Tobu Asakusa! I shall review all the maps and YouTube and take note of the correct information you both have so kindly provided.